Today the Senate and House GOP Caucuses announced a job creation plan at the State House that aims to reduce the cost of doing business in the Commonwealth. The Republican package targets five key areas that employers have identified that would substantially help in the retention and the creation of jobs. Those areas are: business regulations, education, energy, healthcare and taxes. All five areas focus on a different, but costly element of conducting business in Massachusetts. 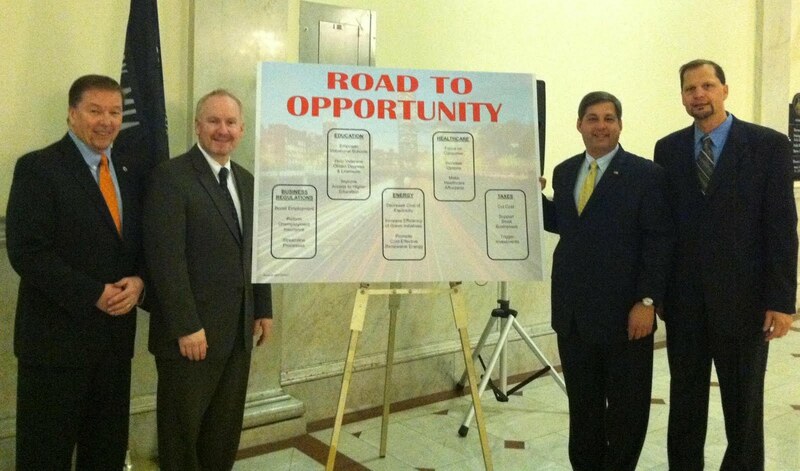 It is the hope of the GOP Caucus to get the 240,000 still unemployed Massachusetts residents back into the workforce. Posted below is a press release issued today by the caucus that highlights some of the key elements of the package. Also posted below is today's press packet that summarizes the jobs creation plan. 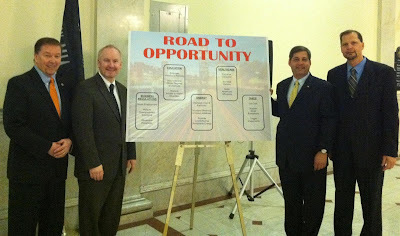 BOSTON – Led by House Minority Leader Bradley H. Jones, Jr. (R- North Reading) and Senate Minority Leader Bruce E. Tarr (R-Gloucester), the Republican Legislative Caucus has proposed an innovative jobs package aimed at cultivating economic growth in the Commonwealth of Massachusetts. The jobs package, which comes on the heels of the Republican Caucus’ statewide 2011 G.O.P. Jobs Tour, offers policies that are key to facilitating economic growth in Massachusetts and supporting individuals and businesses statewide. In speaking with constituents and business owners, House and Senate Republicans have identified five targeted areas aimed at creating and maintaining jobs: business regulations, education, energy, healthcare, and taxes. "We can and should take action now to spur economic growth, and incent job creation. This concrete plan contains specific steps we can take to propel our state's recovery from one of the worst recessions in our nation's history," said Senate Minority Leader Bruce Tarr. "Armed with this plan, Legislative Republicans will begin visiting businesses to chart a course toward economic growth by doing things that really matter for the employers we're counting on to grow our economy." • Energy: Decrease the cost of electricity for businesses and ratepayers, increase the efficiency of Green Initiatives and promote cost-effective renewable energy. • Taxes: Reduce commercial vehicle registration fees, simplify and eliminate corporate fees and taxes, incentivize first-time home buyer savings accounts, and establish a job creation tax credit. Announced by House and Senate Republicans today, the formal proposal will be filed as five major pieces of legislation. In subsequent weeks, members of the Republican Legislative Caucus will travel to local businesses throughout the Bay State to discuss the proposed legislation.